Home > Physical Development 3+ > Can Super Foods Help Children's Development? Scientists say that superfoods can help your child's development. But, before you run to the health food shop for a packet of goji berries, consider what's inside your fridge first. Experts say that, though some foods receive more attention than others, many basics will help your child on the way to a healthy future. So, here's some foodie ideas complete with tips on how to serve them up to a hungry family. 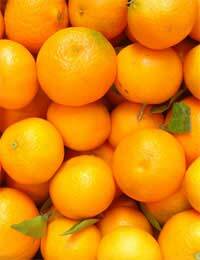 As every school-age child knows, oranges are a great source of vitamin C, which helps stave off seasonal colds and flu. But what they may not realise is that oranges supply the body with a good source of calcium, which is great news for bone development. Oranges are also packed with potassium. This helps to balance the bad effects of salt, which unfortunately features as an ingredient in many kid's snacks. Teatime tip: Orange juice is still the most kid-friendly way to introduce your children to the fruit. Make sure you pick a brand with a high juice content (with no added sugar), or alternatively, make your own with a juicer. Another high fibre contender, kiwi fruit is just exotic enough to tempt children who might still be fruitphobic. The secret behind its distinctive sweet and sour taste is a healthy dose of vitamins (including vitamin E, which helps prevent disease). Don't pick out the seeds, they're a major source of the fruit's fibre. Teatime tip: Serve as a delicious naturally-sweet dessert topped with yoghurt or cream. They may not seem very exotic to sophisticated kid's palettes, but an apple a day really does help keep the doctor away! Flavonoids present in the apple's skin mean they are rich in antioxidants, while the juice is effective against halting viruses. The soluble fibre each apple contains also fights toxic metals like mercury, which can build up in young bodies. Teatime tip: Apples cut into quarters make the ultimate healthy snack that's the perfect size for tiny hands too. Onions aren't normally renowned as a kid-friendly taste, but you might find that your kids love them as the base of a healthy stir-fry or warming soup. It's just as well, since onions (part of the 'allium' family which also includes chives, leeks and garlic) help protect developing lungs and hearts against future problems. Teatime tip: If your kids are adventurous chuck cooked onions on top of a pizza. Children with more timid tastes might prefer them chopped small and hidden away in pasta sauce. While many children might ignore blueberries on their plate, most won't turn their nose up at egg on toast. Eggs often get a bad press because of their high fat levels. But a nutrient called lecithin, which naturally occurs within each egg, actually helps convert that fat into energy faster. An excellent choice for brainy kids - eggs also promotes better concentration and improved memory. Teatime tip: There's no need to dress up an egg! Boiled eggs served with soldiers is the ultimate kiddie comfort food. Hardly a week goes by without another study celebrating the healthy properties of fish. So why don't more children eat them beyond the odd fish finger? After all, fish is packed to the gills with vitamin B, which helps children maintain a healthy metabolism. The 'ick' factor is one barrier. Squeamish children hate seeing fish heads and having to separate the bones from the meat. So, hide it away as a flavour in big dishes, the chances are your children won't notice the difference! Teatime tip: Fish pie is truly tasty - and children don't have to fuss with fiddly skin.